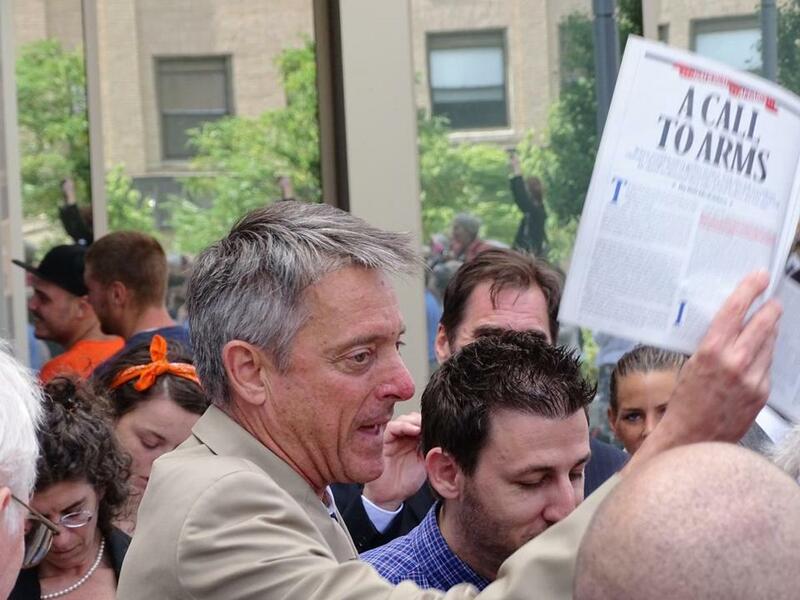 Bristol DA C. Samuel Sutter carried a Bill McKibben article on climate change outside the Fall River court on Monday. Then, in a dramatic appearance at Fall River District Court, he said he empathized with the stance of Ken Ward and Jay O’Hara, who said they were acting to reduce harm to the planet when they used the lobster boat Henry David T. to block the shipment to the coal-burning plant. Ideas: The climate made me do it! The turn of events stunned the activists, who faced up to two years in jail for attaching a 200-pound anchor to their keel to block the path of the coal ship in May 2013. They were planning a rare use of the so-called necessity defense, and would have called a number of high-profile witnesses, including NASA climate scientist Jim Hansen and environmental activist and author Bill McKibben. In exchange for having the state drop charges of conspiracy to commit a crime, disorderly conduct, and motor boat violations, the men agreed to pay $2,000 each in restitution to Somerset and the State Police. O’Hara, 32, a sailmaker from Bourne, said he had walked into the courtroom with “an open heart and mind to whatever path we would be taken. They were elated after their lawyers, who were working for free, told them about the deal and how they wouldn’t have to admit guilt. 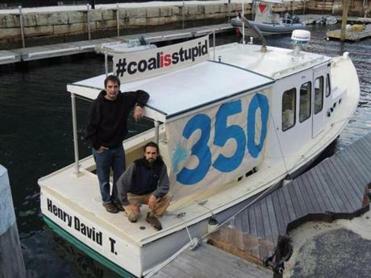 Environmental activists (above, from left) Ken Ward and Jay O’Hara aboard the Henry David T., a refitted lobster boat they used to block the tanker Energy Enterprise from delivering 40,000 tons of coal to the Brayton Point powergenerating plant in May 2013 to try to limit the Somerset facility’s output of greenhouse gases. “We lost an opportunity to educate the public, but we gained an extraordinary statement,” he said of Sutter’s abrupt decision to drop the charges. But Ward and O’Hara lament they have yet to accomplish their goal of shuttering the 51-year-old, 1,528-megawatt power plant, which is one of the region’s largest contributors to greenhouse gases. The Somerset plant, which is in the process of being sold to Houston’s Dynergy Inc., is slated to close in 2017. Plant officials did not return messages. After dismissing the charges, Sutter walked up to a bank of microphones at the courthouse, holding a manifesto against climate change that McKibben wrote two years ago for Rolling Stone magazine. The district attorney vowed to join the “People’s Climate March” in New York, and said his decision to drop the charges “took into consideration the cost to the taxpayers in Somerset, but was also made with our concerns for their children, and the children of Bristol County and beyond, in mind. Afterward, he said wasn’t concerned that he and other prosecutors would be facing a flood of similar cases of activists breaking the law. Sutter said it wasn’t unusual for his office to wait to the last minute before dropping charges. “We have quite a lot going on at the DA’s office,” he said. When asked whether his abrupt decision, which pleased environmental activists around the country, was meant to help him get their votes in case he ran for higher office, Sutter said he was acting on his convictions. Sutter ran for Congress in 2012 but lost in the Democratic primary to William Keating. He has also mentioned an interest in running for attorney general. When he was done speaking at the courthouse, Sutter shook hands with Ward and O’Hara. Follow him on Twitter @davabel.